Picturing Disney: Epcot in Bloom: 2012 Flower & Garden Festival Ebook Review and Coupon! 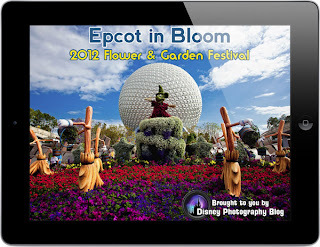 Epcot in Bloom: 2012 Flower & Garden Festival Ebook Review and Coupon! As you could probably guess I just love the Disney Photography Blog! I love taking pictures and I love Disney World so where else would I find myself looking for tips on how to use my new camera or ideas and suggestions for my pictures? When given the opportunity to check out and review the 2012 Flower and Garden Festival Ebook I jumped on the chance to check it out! There is so much in this one book that it is perfect for ANY Disney fan. I downloaded it an put it on my Nook Color and it looked great. I could expand and contract the images and the pages just popped with color! It is in a convenient PDF file so you can view it on your computer, e-reader, or even your smartphone. This is a really great Flower & Garden Festival resource! You will get a comprehensive look at this years topiaries throughout Future World and World Showcase-- Perfect for people who want a way to reminisce about their trip! You will get a handful of fun facts-- Perfect for Disney addicts looking for some new trivia! You will get photo tips and some incredible angles and shots to try on your next trip (I especially like the monorail at sunset and the torii in Japan)-- Perfect for anyone visiting the parks at any time of year! You will get information and images regarding when to visit Flower & Garden Festival and what not to miss-- Perfect for anyone considering a trip to next year's event! Just about ready to head over and download the book? Use the code SPRING during checkout and save $1 off the book price!